School Power Attendance is a simple, powerful and flexible solution for K-12. Attendance is a simple and innovative solution for school teachers, year coordinators, heads of subject departments, assistant principals and principals. It quickly and efficiently records attendance in the classroom, on excursions and for sporting and other curricular, co-curricular and extracurricular activities. Unexplained Absence Snapshot helps Principals, heads of subject departments and student administration to quickly identify unexplained student absence. With real-time accurate information, Attendance helps schools meet their duty of care by being able to better track unexplained student absence. 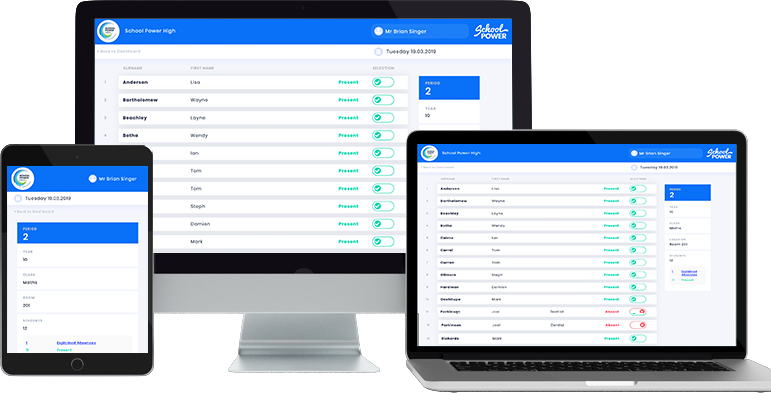 Attendance is an easy-to-use, mobile-friendly secure cloud or On-Premise solution that speeds up and simplifies student attendance confirmation. School leaders know that digital solutions are must-haves for digitally forward schools. Attendance delivers EdTech at its very best for a critical school function. For I.T. Managers and Tech Support Staff Attendance is an easy-to-deploy, resource-light, secure cloud or On-Premise solution. Attendance requires minimal user training and is fast, enabling your IT Systems Manager and users to be up and running quickly and easily. Attendance is a secure cloud or On-Premise solution that doesn’t hold any school data. It integrates with your school’s identity access management system so you can be assured of complete security. Certified for the Standards Interoperability Framework (SIF) we ensure you can confirm attendance anywhere, anytime on any device no matter what Student Management System you operate. Learn more about how School Power can transform your School with a real-time digital attendance solution.